Ghost towns rarely look the way they do on television, especially those in Northeastern Minnesota. There are no tumbleweeds, nor faded saloon doors flapping along a well-preserved Main Street. Winter sees to that. Instead, in Minnesota’s Arrowhead, ghosts tend to stay underfoot. Piles of rusting cans, abandoned vehicles, and the rough outlines of cinderblock foundations softened by overgrowth: these are the only signs of former life in the region’s vanished communities. In the era of the suburb—the era of the commute—few recall a time when most people lived right next to where they worked. The families of Minnesota’s iron miners do; it is one of the few professions where the workplace and home are practically the same thing. That said, there used to be more mines, more miners, and more towns. This is, in part, the story of these places. The 1890s were an exciting time for Northeastern Minnesota. West Coast prospectors, immigrant mine supervisors, and East Coast financiers passed each other in a booming, eclectic Hibbing. In March 1895, a group was prospecting near modern-day Gilbert when they discovered a particularly rich ore deposit. The first mine to tap this vein was named Elba, which was opened in 1898 by the Oliver Iron Mining Company. Early exploration of the mine suggested there were about 3 million tons of ore accessible using the underground mining techniques of the day. As soon as construction began, workers set up housing near the mineshaft. A second shaft, called Corsica, opened nearby in 1901. The influx of workers and families between the two mines prompted the formation of a community between Elba and Corsica Mines, which employed about 200 men each. In all, 1,000 laborers were employed directly by mines in the area. Naming the community was not as straightforward as many Iron Range towns. Often, a settlement would simply assume the name of the mine, which was named by the mining firm which owned it. Regularly, the word “location” would be appended to the mine name to distinguish between the shaft itself and the associated settlement. So “Elba Location” would have been the town next to the Elba Mine. And indeed the town was called “Elba Location” for a short time, but once Corsica opened nearby, residents there did not find the name suitable. “Elba” was considered, but it was already taken by a community near Rochester, Minnesota. To avoid confusion with much more southern Elba—and increase the chances of winning a post office—the names Elba and Corsica were blended to create a new name: Elcor. Not only was Elcor awarded its own post office, but it also featured a school, a hotel, and more than 60 houses. The town’s prosperity mirrored the success of the mine—growing in boom times and crashing during busts. Elcore mines shipped about 400,000 tons of ore through the docks at Two Harbors. In 1921, just ahead of the Great Depression, demand for iron ore dropped, leaving stockpiles of ore beside idled steel mills in the east. Overnight, local employment in the mines dropped from 337 to 20. The situation improved later that year when Corsica Mine reopened, sending 150 men back underground to put food on Elcor tables. Elba Mine would restart operations as well, although only for a short time; it would close permanently in 1925. Partly making up for the loss, Corsica increased capacity through World War II. Nearby, the communities of McKinley and Gilbert also prospered. When Elcor was created, it was on company, not public, property. Its founders held the expectation that the valuable ore below it would be removed from below—not from above. By the 1950s, however, technology had made strip mining much more economical than underground methods. To gain better access to the vein, it was decided that Corsica would be converted to a strip mine—the town of Elcor was suddenly in the way. In 1955 the mining company notified Elcor residents that their community would soon be swallowed by the Corsica mine, a rather unconventional eviction. Today, where the houses, streets, school, and skating rink of Elcor stood a generation ago, a strip mine still operates. And the Merritts certainly could have given the town the station—at the time, they owned the Duluth, Missabe & Northern Railroad, created to transport ore from their mines to the ore docks near their family home in West Duluth. Merritt plats were drawn and sold between 1892 and 1893, closely following the discovery of nearby iron ore only a year before. The deposit would be developed as the Biwabik and Cincinnati mines. Judge J. T. Hale and Captain Joseph Sellwood invested in the land before the discovery, and it occurred to them to develop the lakefront property into a thriving mine community. Their plan worked better than they could have thought. 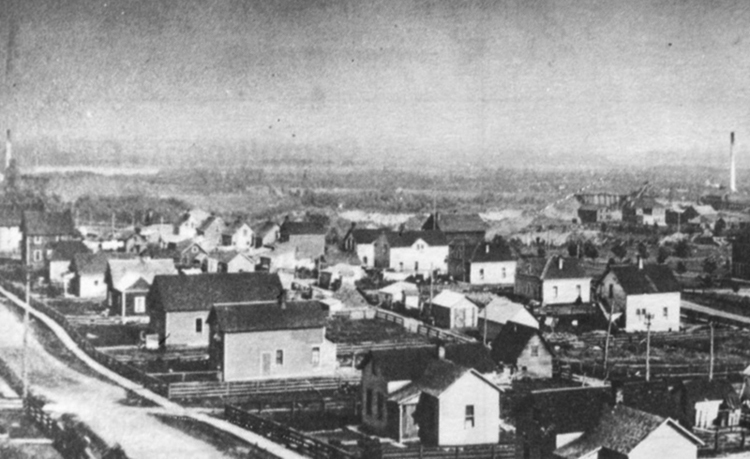 By March 1892, 217 residents already called Merritt home. When 99 of the eligible voters gathered on March 22, 1892 at the Merritt Hotel to incorporate, the town became the first settlement on the Mesabi Range to do so—none opposed. Tragically, only one year later, a wildfire sent those same people fleeing into Embarrass Lake as flames overtook the hilltop town. Residents clung to their most precious possessions as they waded into the shallows to escape the heat and smoke. Heavier items, such as pots and pans, were left on the shore. The town burned for a half an hour—little survived. Although there were no deaths attributed to the disaster, many residents decided not to rebuild in Merritt, the new little town that could neither win the favor of its namesakes nor attract a railroad depot. Almost all of the Merritters relocated to Biwabik. The only underground mine to operate in Lake County was drilled in Section 30, Township 63, Range 11. This cartographic description oddly came to double as a moniker for the place; Section 30 contained the Section 30 Mine and a nearby settlement also called Section 30. Local miners remarked at the activity in the area before the new mine opened in 1910. “The territory,” they observed, “is literally alive with prospectors, drills, and visitors.” Section 30 is about three miles northeast of Ely, the nearest population center. On the other side of Section 30 was, and still is, wilderness; nobody simply “passes through” the area. In 1911, the mine shipped about 300,000 tons of ore, which was above average for the eastern part of the Iron Range. The settlement was mostly abandoned after rail rates increased in 1923, forcing the mine to close. Some residents remained, hoping the mine would reopen. While the area is still populated, the defining features of the Section 30 community—its hotels, dance hall, school, and store—are all gone.